This morning I posted my first Periscope using my personal Twitter handle. Then I deleted it because I got majorly creeped out when some guy was asking where I live. Then I posted my second periscope using the Twitter handle for my blog that I have also been using for work. Welll it turns out when you go live on Periscope it gets tweeted out on Twitter. Uhhh! No! This is just me goofing off! So I deleted that one too. SO then I created another Periscope account @VoraciousTeacher and FINALLY posted and DID not delete it! 1. Have talking points! One of the reasons that I deleted my second scope was I was rambling and kept losing my train of thought. I thought it would easy to remember what I wanted to say. Nope! It was not. At all. So create a little outline. 2. The earlier in the day you do it, the more energetic you are. Energy = people watching. 3. It posts on Twitter if your account originated from Twitter. Whoops! For some reason I love the idea of having two worlds of Regular Teacher and Blogger Teacher. That way I don't have to filter myself or worry about what someone is thinking or offending someone. I mean let's be honest. 4. You can Scope on your iPad! This makes me super excited because then you get to see every nitty gritty detail about my gnarly hair or weird complexion IN GREAT DETAIL! No but seriously, scoping on an iPad just seems easier to me than on a phone. 5. Get followers by participating in LIVE scopes. You "meet" other teachers and get a vibe from them from their comments and you can follow them right in the scope. So while I was busy following them and participating in this live scope they were busy following me I found out once the scope was over! It was pretty cool! Teacher scopers I would recommend include: @TeachInspireChange, @hellojenjones, @schroedershenan (Ashley was the one who actually got me hooked on Periscope! ), @thewhimsicalteacher...honestly I could go on and on! But if you go to my account and then Following you'll find all these peeps and more there! 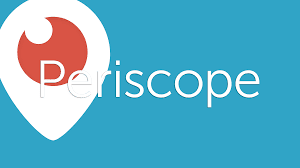 I would love to know your tips and your experiences with Periscope. And go watch my THIRD and FINAL Scope for the day at @VoraciousTeacher.